Heron are notorious for searching out fish ponds for easy pickings during the nesting season. Not only do they have the determination to deplete an entire fish stock from a pond but there is also the potential risk of them damaging the pond liner. Observing these birds habits and actions has helped to find ways of preventing them from feeding on the fish in garden ponds. Heron are tall (90-100cm), with a long neck, long legs to allow them to wade in water and a dagger-like beak evolved for snapping up fish. When in search of food it stands completely motionless in the water, waiting for a fish to swim close enough for it to swiftly seize it. The grey heron wades into water and fishes in the water from a standing position. There are various products available from aquatic stockists or you can make your own ‘Heron proofing’. Netting – Persuading herons not to raid fish ponds is very difficult. Netting is considered by many fish pond owners to be the only effective protection. The downside, however is that marginal plants are likely to get caught-up in the netting. A sheet of black mesh pulled taut above the water is also a good option because plants can grow through. Mesh secured at a height of about 30cm above the water will still allow small birds to access the pond from the edges. Stakes – If netting detracts from the beauty of your pond or gets in the way when cutting back plants etc, then another option is to dig wooden posts into the ground around the periphery. Attach a length of rope to each of the posts to stop herons wading into your pond. This method has been tested by pond owners with positive outcomes. Suspended line – Less glamorous than rope but also less intrusive is the use of fishing gut attached to and held in place by cane, plastic or metal supports at a height 15 to 30cm’s above the ground. This will disturb herons when they walk towards the pond where there isn’t ample shallow beached areas to allow them to land straight into the water. Shelter – Floating plants such as the waterlily offer shelter from predators as do overhanging boulders. Vertical sided ponds – Herons prefer to fish in shallow water, so vertically sided ponds with depths of 1.2 meters or more are less attractive. Fish in steep-sided ponds are therefore less likely to get frightened off unless one at the surface is stabbed by a heron swooping over the pond. Dog – Pets left to run around freely in the garden can make it a less attractive place for heron to visit. While these protective measures offer some resistance to unwanted heron visits, pond fish are only really safe when they hide at the bottom depths of a pond. Herons are a protected species so for that reason plus the fact that past winters have been relatively mild has resulted in an increase in heron numbers in the UK. You are likely to see them roosting in rural treetops particularly near rivers and canals. They can, however travel great distances in search of food so visits to urban ponds are not uncommon. 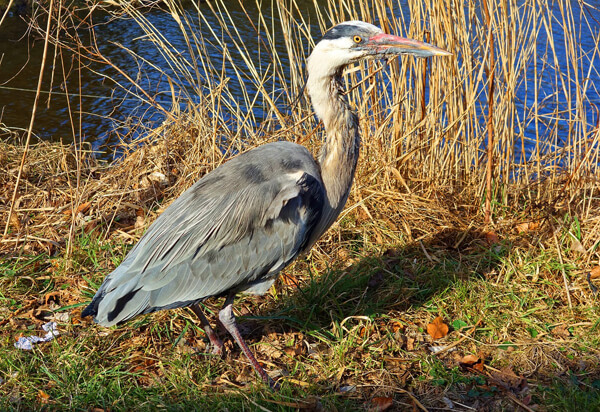 An adult heron needs up to half a kilogram of food per day, so can be extremely persistent and determined in their hunt for food which is why fully protecting a fish pond can be such a huge challenge. In spring and early winter fish are sluggish coming out of or going into a period of dormancy, so become easy targets. This really is a time you need to be most vigilant against these unwanted visitors. This entry was posted on March 20, 2018, in Garden ponds. How to edge an informal wildlife pond and secure the pond liner? It is well documented that a garden pond will add an element of peace and tranquility to any outdoor space. Whether a wildlife pond or one that is home to fish, they are also a source of water that will attract an abundance of creatures without much effort. We have been called to rescue garden ponds loosing water so we do strongly suggest the use of an underlay and pond liner for all pond builds. Flexible pond liners such as Epalyn and Butyl are the most commonly used, as they will adapt to any size and shape. PVC pond liners are relatively cheap, but they deteriorate when exposed to sunlight, puncture more readily and are short-lived. Butyl and Epalyn rubber are more expensive, but durable and will last 30-50 years. In this article we offer advice on how to line and edge a wildlife garden pond with a rubber pond liner while still being able to maintain an informal look. The role of a pond liner is to prevent the lose of water while also helping to maintain a healthy pond ecosystem. Make your pond as big as possible to create many and varied habitats. The Wildlife Trust suggests a pond 1m wide by 2m long to be an ideal size. The deepest part should be at least 0.5 to 0.8 meters. A pond that is too shallow will heat-up too quickly in summer with the risk of turning green and ice over in winter starving your pond of oxygen. Ensure some edges are shallow and sloping to allow amphibians and small creatures easy access and exit. Include planting shelves. Place boulders intermittently between baskets planted up with plants, merging with the rim of the pond for a natural progression from land into water while also secure the pond liner in place. Aquatic plants provide much needed shelter and protection from predators. This creative mix of plant and boulders meeting with the edge of the pond also hides the visibility of the pond liner. Add native plants from other garden ponds or garden centres. Never take plants from the wild. March is a great time to construct a pond and add plants giving them all season to establish themselves. Include a rim or lip around your pond particularly if you intend using turf for the edging. The lip is there to prevent water and soil from draining from the cut turf into the pond bringing with it unwanted nutrients. This photo is a of a very big and deep pond in construction. I have shared it as an example of a lip or rim to the edge of a pond and to show the underlay overlay on top of which the pond liner is installed and then edging material or turf is placed to keep both in place. For the beached area of a wildlife pond we also recommend adding an underlay above the pond liner for added protection when adding sand and gravel. 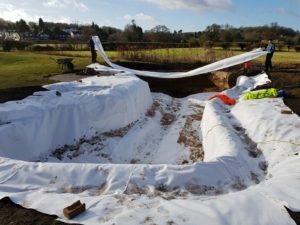 The underlay will also help to stop the material used to create the sloping area from sliding into the deepest area of the pond. With wildlife ponds there is a variety of methods used in the edging. In many cases all options are used – buried edge, boulders, stone slabs, turf, planted or gravel edges are all used. A buried edge is when the lip of the pond liner is buried in the sand. The only possible negative feature of this type of edging is that when the water level drops the liner is exposed and takes away the ‘natural-look’ of a wildlife pond so it isn’t one of our favoured choices. When measuring up your pond liner include an extra 10% for the overlay to secure it in place. You can add the underlay both underneath and on top of the pond liner to help the sand or gravel to stick to it in a gradually sloping shallow beached area of a pond. Or, you can glue the boulders to the pond liner with a waterproof sealant. Then lay sod around the pond. Edging a pond with paving slabs or boulders is a lot easier than using turf, however turf does offer a far more natural transition from land to water. Unlike stone, turf won’t get hot to the touch so is far kinder to small creatures when visiting your pond. If you prefer to edge your wildlife pond with turf, we recommend growing your own to avoid pesticides leaching into your pond. Use play sand or well washed gravel to create the beached sloping edge into your pond. Old logs offer a great form of cover and protection to wildlife so add a few around your pond. Add water snails to keep your pond water relatively clean. When you have finished building your pond insects, amphibians and invertebrates will find your pond surprisingly quickly on their own. Pond liners are an easy way of containing water for wildlife ponds particularly where the ground is porous. The pond liner does not need to detract from the natural look of your pond. Cover it with smooth surfaced pebbles. Don’t skimp on lining your pond – a high quality material will last for years with a reduced chance of puncturing. Any repair work will upset a well balanced pond with an established ecosystem. Rubber pond liners such as Epalyn (EPDM) or Butyl are non-toxic to wildlife and don’t leach chemicals into the water. These pond liners are durable, flexible and resistant to UV rays so will stand up to sunny conditions and the presence of wildlife for more than 30 years. This entry was posted on March 14, 2018, in Garden ponds. “Ponds are a lovely addition to any garden and can provide a rich habitat for a range of wildlife. However, without care ponds can soon become an eyesore with overgrown plants, weeds and water that is unhealthy for fish and other wildlife. Occasional cleaning and regular maintenance are required.” as quoted by the Royal Horticultural Society. With that in mind, here are 7 spring pond maintenance steps to get your pond ready for the months of warm summer weather. 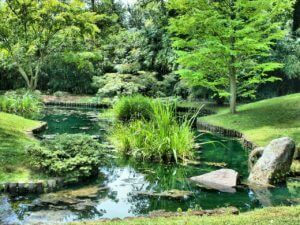 A pond that is well maintained during the Autumn are less likely to require a lot of work at the start of Spring versus those where leaves and dead plant matter have been left to sink to the bottom, and aquatic plants haven’t been cut-back ready for the next growing season. Just as gardens need regular attention, so too does your pond! Give your pond pump and mechanical filter a good cleaning. If you have a bio-filter, then return it to your pond. For more of pond filters, please refer to the next paragraph, which discusses the two filter options and seasonal maintenance requirements. Remove leaves or other debris that may have sunk to the bottom of your pond – as the water warms up, any debris left in your pond will start to decompose and affect the health of fish. Check your fish for any illnesses or wounds. Divide and repot pond plants. Avoid re-potting with soil full of organic matter. Most water plants grow well in sand and don’t require fertiliser. Water lilies are, however, an exception and do require fertiliser for a healthy growth. Water plants get their nutrients from fish waste. If you have extra plants after you have divided them, you may want to consider growing them in low, damp spaces in your garden. For fish ponds, make sure that up to half of the surface of your pond is covered with floating plants as it gives the fish a place to hide from predators and keeps them cool in the heat of the summer. It also keeps the sun from encouraging algae growth. If your pond is lined with a pond liner check that the material you have used for the edging is still in place, sufficiently covering the pond line to prevent any possible damage from claws or the UV rays – rubber pond liners are UV stable and will withstand long periods of UV exposure – but, a bare edging exposing a pond liner can detract from the beauty of the pond. A mechanical filter works by filtering out dirt, solid waste and algae from the pond water drawn in via a submersible pond pump. Water passes through foam, coarse sand, and filter granules to remove waste matter. This type of filter is inexpensive and usually installed in the pond. It is effective as soon as the system is switched on and can be run intermittently. A bio-filter or biological filter, works by creating a suitable living environment for certain types of bacteria which ‘clean-up’ the waste material that fish produce – breaking down the waste and recycling it. Fish waste is excreted in the form of ammonia (which is toxic to fish). The naturally occurring bacteria in a pond, known as nitrosomonas breaks down ammonia into nitrite using oxygen to do so. Nitrite is then converted by the bacteria, nitrobacter into nitrate – an important plant food . An essential spring pond maintenance step for a bio-filter is to return it to the pond and give it a boost of a bacteria/enzyme product to ensure the good bacteria colony starts to grow quickly. Bio-filters efficiency is affected by oxygen supply, temperature and water flow. Spring pond maintenance should be seen as a time to step outdoors and relish this amazing time of the year when nature awakens from her winter slumber. This entry was posted on January 10, 2018, in Garden ponds. Why a wildlife pond for your garden? Wildlife ponds can make a huge impact on environmental issues that affect us all such as climate change and pollution, as well as being fantastic for wildlife! Provides a most welcome habitat for frogs to breed and spawn. Male frogs will return first to the pond where they were raised and attract the females to them by croaking. Frogs mate in shallow areas of the pond amongst plant growth. The female frog uses plant growth on a shallow shelf area of the pond to support herself during spawning. Ponds attract frogs which in turn control the slug population – and save your vegetable garden and flower-beds! Newt’s natural behaviour is to wander around looking for a pond to colonise. Building a garden pond will help shorten their journey. A rockery or log-pile built alongside a garden pond will offer a place for newts to hide and shelter at the end of the breeding season. A wildlife pond planted with aquatic plants such as water forget-me-nots, watercress, water speedwell and flote-grass provides a safe place upon which newts can lay their eggs. Newts will lay their eggs in leaves which have become folded over. Insects need water to survive too! An invitation for dragonflies and damselflies to visit during the summer months. Keep mosquito numbers down during the summer months by inviting carnivorous damselflies and dragonflies into your garden. A pond is likely to attract toads to your garden. They in turn will control insect numbers. Toads thrive on insects and therefore are an alternative to using gardening pesticides to protect your vegetables. Toads are more likely to be attracted into gardens that also offer moist environments under rocks, logs and trees. This entry was posted on November 22, 2017, in Garden ponds. The temperatures are dropping and the last of the autumn leaves are falling to the ground creating carpets of yellow, orange and browns. Autumn has it’s own special beauty as it draws the growing season to an end ahead of a period of semi-dormancy – a time to relax and plan for spring! Before winter arrives, however there are a few essential tasks that need doing as discussed here. Investing in essential garden tools will help get these jobs done to a high degree of efficiency. Autumn is also the perfect time of the year to build a garden pond in your garden. Wildlife will love you for this addition to your outdoor space. 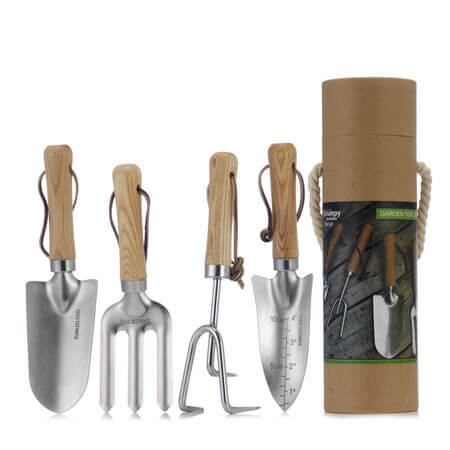 And, with every job having the right garden tools to hand helps get things done more effectively and efficiently. A grumpy gardener who became frustrated with the garden tools in his shed decided to design his own. Today he has his own unique range of garden tools to keep flowerbeds weed free, hedges and roses neatly pruned back, leaves collected for the leaf composter, weeds and moss carpets removed from between paving and the garden kept tidy through the seasons. ergonomically designed secateurs with knuckle guard to avoid scratches to the hand when pruning – not all gardeners like wearing gloves! If, like me you love to potter about in your garden, you would probably agree that the easiest way to tackle these jobs is with the correct garden tools and a garden kneeling pad that will take the pressure off your knees while you enjoy the pleasure of transforming green space into a haven for wildlife and a place to relax and flitter away time during the warm days of summer. This entry was posted on November 15, 2017, in Garden ponds, Gardening. A flat sheet Epalyn pond liner allows for creative design flexibility and the build of ponds that blend in with the surrounding landscape. The photographs shared here were sent in by one of Liners Online customers. A viewing point has been constructed over the pond offering a marvellous creative feature to compliment the long flowing pond. The decking area offers an idyllic setting to sit, relax and soak-up the beauty of this garden pond build. Rocks have been used to edge the pond and secure the pond liner in place. If you are planning a similar finish to your pond and are concerned about the rocks bearing down on the pond liner and puncturing it, you can line the top of the pond liner over which the rocks are to be placed, with geotextile protective underlay. Epalyn pond liners are the ultimate product for UV resistance. The 0.85mm and 1.0mm are the same as 0.75 mm but, give added piece of mind with the extra thickness for more demanding applications. For the average garden pond build the 0.75mm thickness is ideal. Epalyn offers high flexibility and elongation properties, superior weathering resistance, and due to it’s durability it also offers low maintenance after installation. Sharing photos of a pond during construction and as a finished product, helps others to draw inspiration from it’s unique qualities. Hence why we are so grateful to able to share photos sent to us by customers. This entry was posted on November 3, 2017, in Garden ponds. The transition from summer into autumn is marked by the colour changing of leaves, cooling temperature and the nights getting longer. For the pond owner it is the fall of the leaves that alerts them to the onset of autumn. The lovely hues of red, orange and brown colours bring an exciting dimension to footpaths, streets and parks. But to ponds there is these fallen leaves risk floating to the bottom of ponds and resulting in dangerous increase in debris levels if not dealt with. A question that frequently gets asked by pond owners at this time of the year is whether a pond heater is necessary to invest in. If you don’t keep fish in your garden pond then a heater is not needed at all. If you have followed the Autumn Pond Maintenance guidelines as illustrated in the above infographic, then you are not likely to need a heater either and I will explain why. A pond that ices over for a few days is not likely cause stress to your fish or affect the health of your pond. During the cold winter months fish are less active, their metabolism has slowed and they are eating very little if anything at all. They will also spend the winter at the bottom of the pond where the water is a little warmer. With the slowed metabolism fish excrete less waste into the water. A thorough Autumn pond maintenance regime of cutting back, pruning dead foliage and skimming-off leaves means less organic matter sinks to the bottom of the pond to turn to sludge releasing carbon dioxide into the water as it continues to decay. So, with no sludge and clean healthy water an iced over pond isn’t going to lock in any toxins. If you live in the northern most parts and you do experience periods of snow and freezing temperatures for extended periods then an aerator or pond heater maybe an option – although leaving a plastic ball floating on the surface of your pond will help prevent it freezing over thereby allowing gases to escape and oxygen to enter the water. This entry was posted on October 4, 2017, in Garden ponds. The availability of flexible flat sheet pond liners allows for design flexibility. Ponds need not be a regular square, rectangular, or a round shape. Flexible Epalyn and Butyl rubber pond liners mould to the contours of ponds, are durable, resistant to the damaging effects of ultra-violet rays and won’t go brittle with age. Ponds with adventurous shapes add charm and fascination to any amount of garden space. To calculate the pond volume of an irregular shape is a little more challenging and less likely to give an absolute accurate surface area measurement relative to regular shaped ponds. 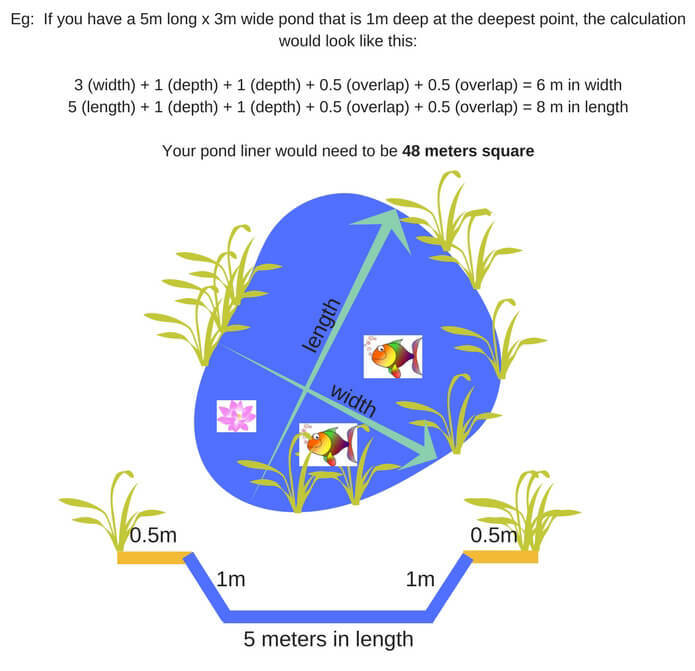 In this article we offer a few tips on how to calculate pond surface area and average pond depth to get as accurate a pond volume as possible. Calculating the volume in gallons or litres is important if you are wanting to stock your pond with fish. It is also necessary to help determine the size pond pump to reach pond water turnover. Having an accurate measurement of pond volume is also important if ever you have the need to add healthy bacteria or algaecide to the water. To calculate pond volume of a regular shaped pond, you need to measure the length, width and the depth in either meters or in feet. If your pond is an irregular shape the easiest approach is to divide your pond into regular shapes, determine the surface area of each shape and add the sum of each together. If, for instance your pond is kidney shaped, then divide your pond into three basic shapes – two circles and a rectangle. Measure each separately. Add the three totals together and then multiply by the deepest pond depth to determine volume. Taking measurements is easiest done prior to filling your pond with water. Draw a square or rectangular shape around your pond by knock stacks into the ground and using string to get as a accurate a shape as possible. Measure the longest length then do the same for width. Using a sheet of graph paper draw out the shape of your pond using these dimensions. 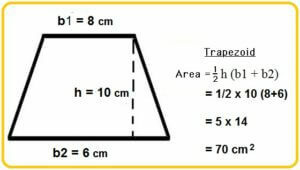 From your drawing of an irregular shape divide it into shapes that are easy to calculate surface area – trapezoid is half the width multiplied by the addition of the two lengths, a triangle is half of base x height and a circle is 3.14159 x radius2. Multiply by 1000 to get volume in litres. If pond has been filled with water you can get a depth measurement by wading into your pond with a stick and marking off the depth/s. Volume is surface area multiplied by the deepest depth – for ponds with out ledges. For those with planting ledges, again divide your pond into sections as per the different depths. Measure each depth then add them together and divide by the number of measurements taken. The purpose of calculating pond volume is to make sure you buy the correct size filter to maintain adequately healthy water conditions for the long-term well being of all pond inhabitants. All filters have a guide to the maximum pond size they will cope with. Manufacturers recommend that the entire volume of a pond should be passed through the filter approximately every two or three hours. It is important to also note that for a filter to work efficiently, it must be teamed with a pond pump that supplies it with a sufficiently strong flow of water. Knowing the size and capacity of your pond also allows you to calculate how may fish and number of plants to add to your pond. If you intend to have a highly stocked fish pond then it is advisable to install a filter to cope with one and a half times the capacity of the water in your pond. This entry was posted on August 23, 2017, in Garden ponds. 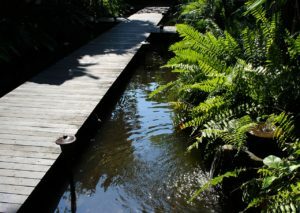 Garden ponds, as all enthusiasts will agree bring so much joy and tranquility to a garden of any size. But, they can also be considered a hazard to young children particularly between the ages of 1 to 5 years old. Pond safety should be an important consideration. Visiting children are a higher risk as they are not likely to be aware of the potential dangers of water. If you have young grandchildren or entertain families with young children there are steps you can take to ensure their safety around your pond. Children are easily drawn to water so even having neighbours with young children should be enough to alert you to putting pond safety measures in place. 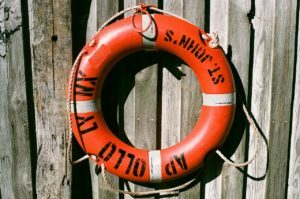 A drowning can happen within minutes of a parent being distracted. Overgrown ponds are reported to be the most hazardous as the transition from ground to water is far less obvious. According to government figures, four out of five residential pond drowning incidents do not happen at the child’s own home. So while you may have a perfectly safe water feature, your neighbours, friends and relatives may not. 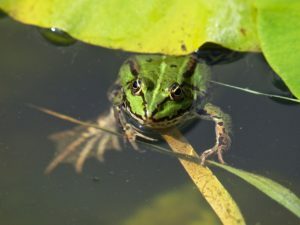 According to Froglife and many wildlife charities, filling-in ponds rather than putting safety measures in place should always be a last resort, since the damage this can do to wildlife communities locally can be enormous. Ponds are great for teaching children about wildlife and the different stages of the life-cycle of small creatures such as frogs unfold in natural surroundings. Adults with young children in their care should be vigilant at all times – even a bucket of water is a potential hazard. This entry was posted on August 8, 2017, in Garden ponds. How much pond liner do I need? Knowing how much pond liner you need will save your budget (and time!) – too big or too small is wasted money. Calculating how much pond liner you need is dependent on the accurate measurements you take of your pond. You will need these to add into a pond liner calculator which will take your measurements to determine the amount of pond liner and protective underlay you will need to order. So, let me take you through how to calculating how much pond liner you need. Pond liners offer greater flexibility in pond design allowing you carte blanche in creativity. However, the further you move away from the traditional rectangular or circular pond shape the more you need to understand how to take measurements. With all measurements remember to add in a little extra for an overlay (visit ‘Pond planning and construction‘ for more information). Now, add one side (Length or Width) to two times the depth plus amount needed for the overlap (0.15m). The depth of the pond needs to be multiplied by two because the pond liner needs to go down one side of the pond and back up the other side. How much of an overlay or overlap to add into your calculation really depends on how you plan to fix your pond liner in place. So, increase or decrease the amount of overlay depending on installation and edging method. I have used an overlay of 0.15m in my example calculations. Multiplying the depth by 2 accounts for the depth on both sides of the pond. And, the same applies to the overlay. Planting shelves in your pond design don’t need to be accounted for as they won’t significantly affect the pond measurements. The size of pond liner required can be calculated as: Maximum length + (2 x maximum depth of pond) x maximum width + (2 x maximum depth) with the overlay added into the length and width pond measurements. Or, take each measurement and use a pond liner calculator to do the calculation for you. For more complex pond designs such as an L-shaped or U-shaped pond, the easiest way to take measurements is to divide the pond into sections. So for an L-shape you would measure as a square + rectangle. The depth where the two liners will meet only needs to be added into the calculation once. Measure the length of the two outer longest sides of the pond. Multiply the maximum depth measurement by three and add it to the two longest lengths of your pond to get pond liner dimensions required. Use our pond liner size Calculator to get the pond liner and underlay measurements you need to order for your pond design. For L-shape and ponds with a plinth you may want to discuss these with our pond experts first. 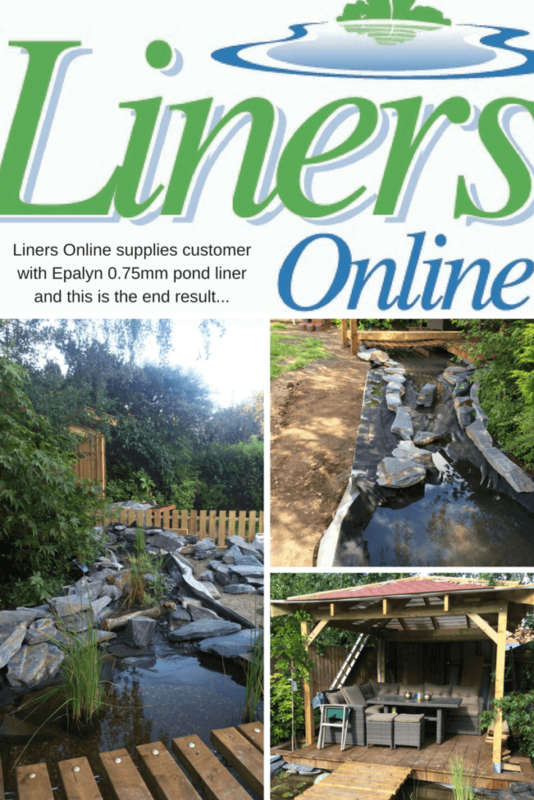 You can phone us at Liners Online on 01526 399 033 for all your pond liner queries. This entry was posted on July 13, 2017, in Garden ponds. As with all home and garden projects careful planning is required. 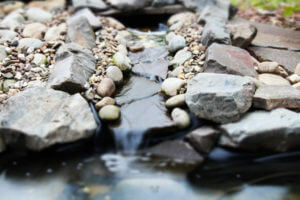 So, in this article I aim to share all the steps you need to put in place including a project budget if you are going to include a pond liner, underlay, pond pump, filter, aquatic plants, fish and other finishing touches to your build. With any pond build, the first and most important step is to decide what the purpose of your pond will be. Is it to attract wildlife, to keep gold fish, home Koi Carp or grow aquatic plants. Are you going to use natural or a mechanical water quality control system? for aquatic planting you will need to add a stepped base or shelf to your design plan. The shelves can be used to accommodate marginal plants of varying heights or to place planting baskets. Shelves make it easier to remove plants to cut back at the end of the season and for general pond maintenance. The design and planning for this type of pond is much like the steps you would take when planning what to plant in a flower bed so that choice works together in a creative fashion. for a fish pond, water volume is an important factor when considering design and size. The bigger the pond, the easier it is to maintain healthy water levels. Goldfish require a pond of at least 5 meter square and a depth of no less than half a meter – or a volume of 3000 litres. Koi require a minimum of 5500 litres – or minimum pond size of 2.5m x 2m x 1.2m. There is also a maximum depth – a Koi pond shouldn’t be deeper than 3 meters because sunlight won’t penetrate sufficiently to promote the vital growth of healthy algae. Koi are big fish and need a large volume of water. They also produce high amounts of waste. For both those reasons, a steep or vertical sided pond is recommended. It guarantees the largest volume of water for the space occupied by the pond and steep sides don’t accumulate waste materials and debris that can release harmful ammonia. a wildlife pond is probably the easiest type to build and maintain. No retainer wall or brick work involved. A wildlife pond just needs a sloping edge so small creatures such as frogs can easily enter and get out. a natural pond is one in which the water, soil, plants, and animals all live in harmony. There is no man-made intervention such as a pond liner to contain the water or pond pump to aerate the water. The bigger the pond the easier it will be to maintain relative to a small shallow water feature. This is because a small pond gets warm quicker in summer and is more likely to freeze over in winter relative to a bigger and deeper pond. However, there are solutions to every situation – when the temperatures rise during the summer months add extra aeration to your pond – use an air pump to achieve this and make sure your pond receives sufficient shade. Use a pond thermometer if you plan on homing fish and keep an eye out for any signs of distress. The lethal water temperature for Koi and goldfish is reportedly 90 degrees F. The higher the water temperature, the less dissolved oxygen it is capable of holding. Fish have a greater demand for oxygen at higher temperatures so the distress they show is due to breathing difficulties. The next step is to decide where to position your pond. A formal pond into which a box-welded pond liner is fitted can be raised off the ground or dug into the ground. It is about deciding which fits best with your garden size and overall landscape design. site a pond on level ground – this will also help avoid rainwater run-off, which could bring with it fertilisers carried into your pond. Added nutrients will have a negative impact on water quality. ponds need 50 to 70% of the water to be in shade. This can be achieved by building your pond under a pergola (or building a pergola to go over your pond) or shaded in relation to the position of your pond to a garden wall or house. Include floating plants can also provide the necessary amount of shade ( fish can’t breath if too much of the surface is covered by aquatic plants). Building your pond too close to a tree to provide the necessary amount of shade is possible although you will have to keep on top of skimming off all the fallen leaves before they sink to the bottom. 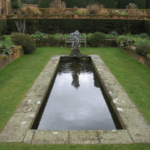 Now that you know what the purpose is for building your garden pond, the size that we best fit in the space you have available and where you are going to position it – the next step is deciding on design. A box welded pond liner doesn’t restrict you to a geometric with variations of square or rectangular layout. It is possible to be more creative with your design and still have your pond lined without creases or folds to the pond liner. The main criteria is that the design needs to include vertical sides. Use a length of rope to play around with different shapes until you come up with one that will work in your garden and against the backdrop of your surrounding landscape. A raised pond can be built using bricks, concrete blocks or railway sleepers. Sunken ponds require digging. The soil dug out can be used in flower beds or to landscape your garden. Once you have finished digging and are fully satisfied with the layout and depth you will need to remove as many of the stones and rough gravel as possible so as not to damage your pond liner. Measure the widest width, the longest length and the deepest point of your pond. These dimensions are necessary to calculate how much pond liner and protective underlay you will need to order. It is always best to tackle the job with another pair of helping hands. First unfold the protective underlay and line the hole dug for your pond. 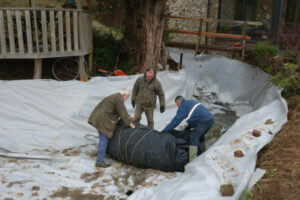 Then, with great care unravel the pond liner and, with help lift and place over the pond. Allow your pond liner to sink into the deepest area of your pond. Step barefoot into your pond to carefully push your pond liner into the contours. Pleat and fold as neatly as possible into the corners. Don’t be tempted to cut any excess pond liner until the pond liner has ‘settled in’ and you have filled your pond with water. The final step is to decide whether you are going to use natural means of aerating and maintaining water quality or mechanical by way of a pump and filter. The role of a pond pump is to keep the water moving and by so doing it add oxygen to it. A filter added to the pump will remove debris. This is particularly important when keeping fish because their faeces, if left in the water increase the nitrate levels. This in turn affects water quality. Goldfish and Koi excrete waste into the water in the form of ammonia from their gills and nitrate in their faeces. And, algae grows in ponds where there are high levels light and nutrients. When nutrient levels get high enough, algae takes over the pond and chokes everything else out. Ponds lined with a pond liner means there is a lack of soil in the bottom therefore few micro-organisms compared to that of a natural pond. There are also fewer surfaces for mico-organisms to attach to. Therefore you have to create an artificial place for the microbes to live. A filtration system can be used to provide a surface for the micro-organisms to live on. Microbes take-up waste animal and plant matter as they float around in the water keeping the water clear of nutrients needed for algae to thrive. 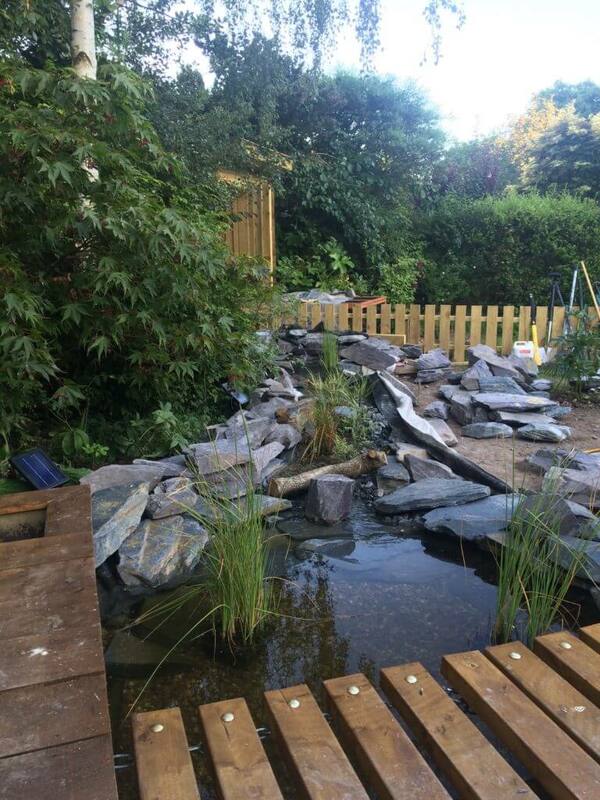 Building a pond in your garden is such a rewarding challenge to take on. The finished product will provide you with endless enjoyment so I hope these steps help you to get to work on your plans. This entry was posted on June 30, 2017, in Garden ponds.